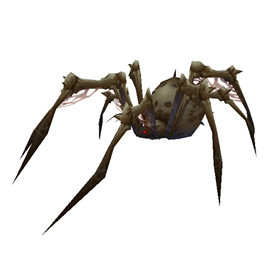 I really wanted to like Giant Bone Spider, but the life return abilities are insufficient to give it the survivability necessary to make it a top battle pet. I occasionally use for PvE pet battles, but only in battles where any other undead would also suffice. Tarr the Terrible is the only fight that comes to mind where Giant Bone Spider even comes up as a viable possibility. I'm a bit disapointed with this pet appearance and habilities. For a great boss from Naxxramas like Maexxna, I expected a pet more powerful and less common. I don't know if this pet has been nerfed or what, but by the time I got him up past level 20, he became far to squishy and his abilities far too weak to be very viable in battle. Its a shame. Gone are the days when you could Poison Spit + Siphon Life + Death Grip and watch the opposing pet get destroyed in back line. Still possible to actually do this but the damage has been nerfed to a more sensible range. Fast for an undead and can still be a solid tactical pet. Switch moves, while not doing as much damage, are still powerful moves. Problems is that 333 speed imp is better at it, Bone Bite being 100% move makes its damage output a bit on the low side. Not the power it once was. Just got mine of the AH for 750G thought it was a pretty good deal. Giant no :( but it is slightly bigger than all the others I have. From a pet battle point of veiw this guy kinda sux. Beast moves strong vs critter, undead takes more damage from critter. Maybe good vs the handful of humanoid wild pets. I wish this guy had a unique look to match the rest of the raid pets, even if it cloned the boss that dropped it. does it need to be on 25 man or does it also drop in 10? This dropped for me today in Naxxaramas. I love him. He's got tiny glowing red eyes, a spikey abdomen, spindly cobwebby legs, and he looks larger than your average spider. Found in a dusty egg clutch at the back of Maexxna's lair, these creatures are already undead when they hatch.